What Can I Do to Cover Exposed Plumbing Under My Bathroom Sink? 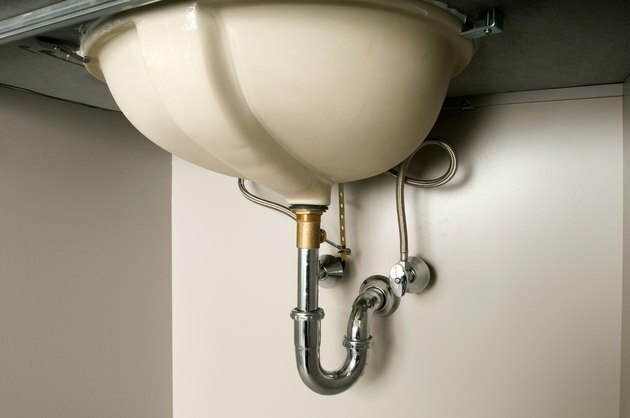 If you have a bathroom with exposed plumbing, you may want to cover it up. Especially, if the plumbing is old and gritty looking. This will detract from the overall appearance of the room no matter what else you do with the decor. You can cover the plumbing in several manners, depending on whether you own or are renting and what your budget is. Choose a method that suits your needs and blends with the rest of your decor. Sink pipes are not an attractive addition to a room. Set narrow shelves under the sink so there is room behind the shelving for the pipes. Fill the shelves with attractive or practical objects, such as towels or baskets. Cut a hole in the back of a tall, attractive basket so that the pipes can fit in when the basket is pressed up against the wall. This allows you to cover the pipes and still use the basket to store items. Place a tall, wide plant under the sink so the leaves of the plant hide the pipes. You can also set several plants next to each other. Choose plants that thrive in low-light and humid conditions or use artificial plants. Install a sink skirt around the base of the sink. This is a traditional method of hiding pipes. You can make one yourself out of an old sheet by cutting it to fit around the skirt and attaching a Velcro strip to the top hem and the side of the sink. Set an attractive laundry basket under the sink to block the pipes. You'll need a laundry basket that fits the space nicely. If you choose a wicker one with a fabric liner that matches your decor it will blend into the room. Alternatively, you can set two or three tall, skinny baskets under the sink and use them for storage. Set a small folding screen under the sink. You can make the screen suit your decor by covering it with fabric or wallpaper that fits the room. Install a cabinet under the sink.